The Fish and the Frogs tells the story of animals and the researchers who studied them on three continents. It reports a bit about how science is done, but focuses more on why it is done. We generally do not just study organisms because they are useful to humans. We investigate their lives because they are beautiful and intriguing, and only secondarily because of the possible direct uses we might make of them. It is an example of what Edward O. Wilson called biophilia. Fishing and keeping pets started Bill Magnusson′s interest in fish and frogs, and this led him to be a researcher and an admirer. He wrote this book in the hope that it might stimulate young people to follow a similar trajectory. 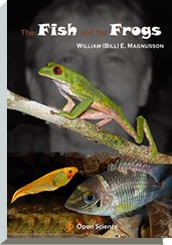 William (Bill) E. Magnusson has studied fish and frogs for the past 40 years and is the author of more than 200 scientific publications on subjects ranging from statistics to biodiversity. Bill graduated from the University of Sydney in 1974 and carried out research in Arnhem Land for his Ph.D. thesis. He has been a researcher with the Brazilian National Institute for Research in the Amazon (INPA) since 1979, and now coordinates the National Institute for Science Technology and Innovation for Amazonian Biodiversity (INCT-CENBAM). Bill has been the major professor for over 60 post-graduate students, and lives with his wife and daughter in Manaus, Amazonas, Brazil. Young biologists, fish and amphibian hobbyists, people interested in scientific method.